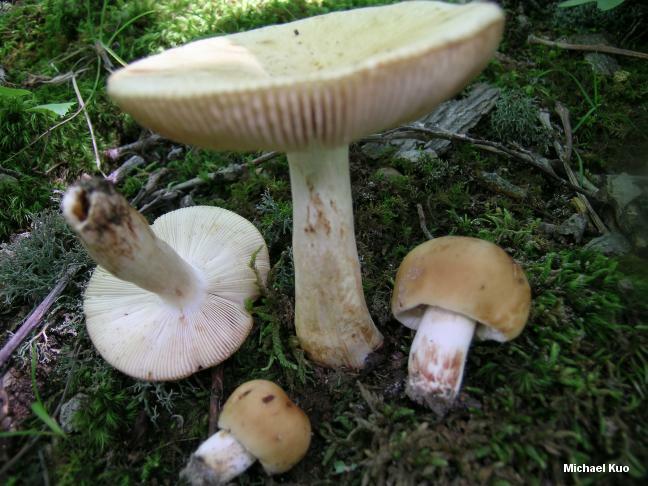 This member of the foetid russulas group can be fairly easily separated from most of the others in the group on the basis of its dull yellow colors, large size, and sickly sweet odor. 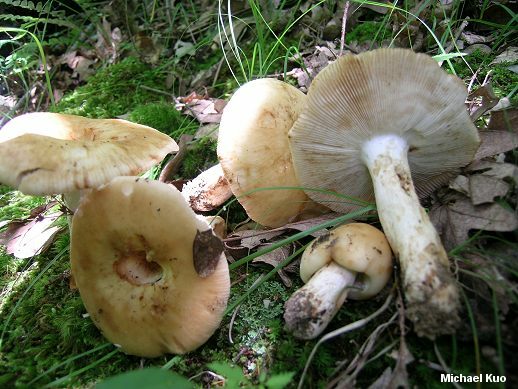 It lacks the orange colorations found in Russula foetentula, and lacks the granules or scurf found on the caps of Russula granulata and Russula pulverulenta. It is not brown like Russula amoenolens. But a microscope may be needed to separate Russula fragrantissima from Russula laurocerasi. Though the latter is usually a bit more slender it is otherwise nearly identical to the naked eye; its strikingly ornamented spores are what ultimately distinguish it. Ecology: Mycorrhizal with hardwoods or conifers; growing alone, scattered, or gregariously; summer and fall; apparently widely distributed in North America. Cap: 7.5-20 cm; convex or cushion-shaped when young, becoming broadly convex to flat, with or without a shallow depression; slimy when wet and fresh; dull yellow to yellowish or brownish yellow; the margin lined at maturity; the skin peeling away easily at the margin, sometimes beyond halfway to the center. 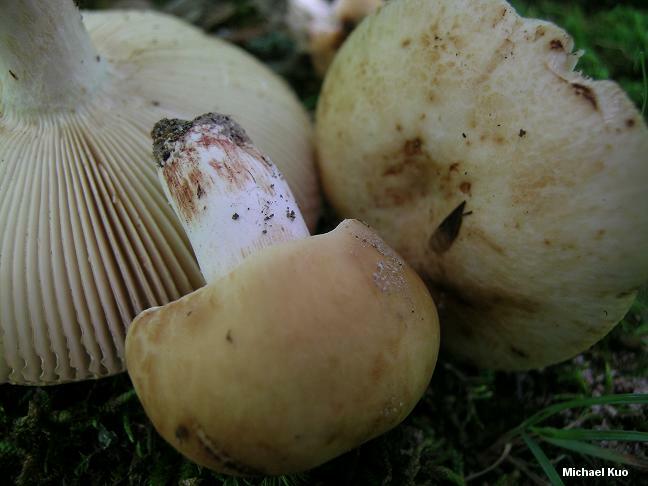 Gills: Attached to the stem; close or nearly distant; sometimes forked near the stem; whitish to creamy; often discoloring yellowish brown to brownish, but not bruising. Stem: 7-15 cm long; 1.5-6 cm thick; white, discoloring brownish to yellowish or reddish near the base; dry; often becoming cavernous; more or less smooth. Odor and Taste: Odor strong and fragrant, reminiscent of maraschino cherries, almonds, or benzaldehyde--with a foul component which begins to take over, especially in age; taste mild to moderately acrid. Chemical Reactions: KOH on cap surface negative to pinkish. Iron salts on stem surface negative to pinkish. 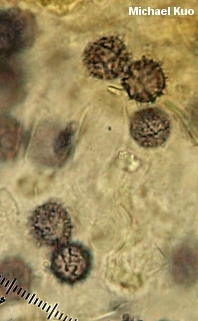 Microscopic Features: Spores 6-9 x 6-8 µ; broadly elliptical or subglobose; with warts and ridges up to 1 µ high, sometimes with connecting lines that may form a partial or nearly complete reticulum. 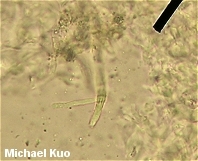 Pleurocystidia abundant; positive in sulphovanillin. Pileipellis a cutis embedded in a gelatinous matrix; pileocystidia clavate to fusiform, ochraceous-refractive in KOH and often positive in sulphovanillin. REFERENCES: Romagnesi, 1967. (Shaffer, 1972; Arora, 1986; McKnight & McKnight, 1987; Kibby & Fatto, 1990; Phillips, 1991/2005; Horn, Kay & Abel, 1993; McNeil, 2006.) Herb. Kuo 06249601, 08050403, 07080803.